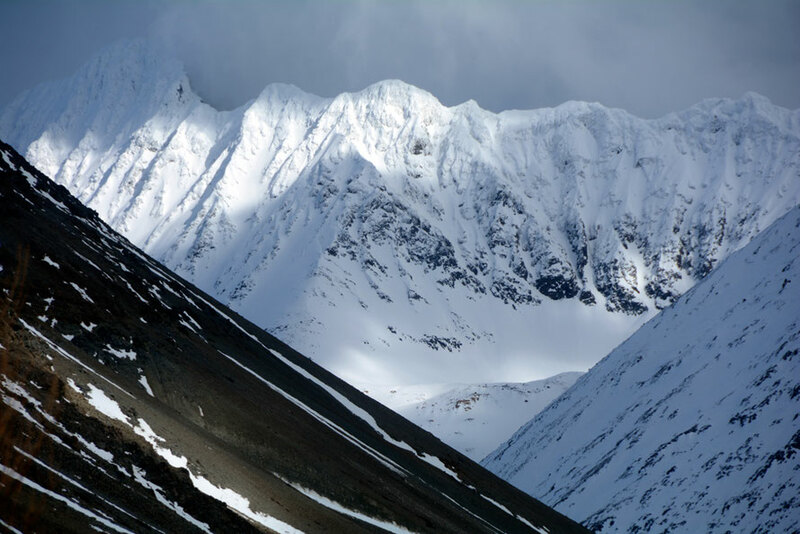 The incredibly harsh terrain of the Lyngen Alps. The Lyngen Line was designed to create a defensive line at a pinch point in the tortured geography of Norway's north-south communications as far north as possible so that if there was a Soviet attack it could be held up while reinforcements were brought in from the large German force in southern Norway. 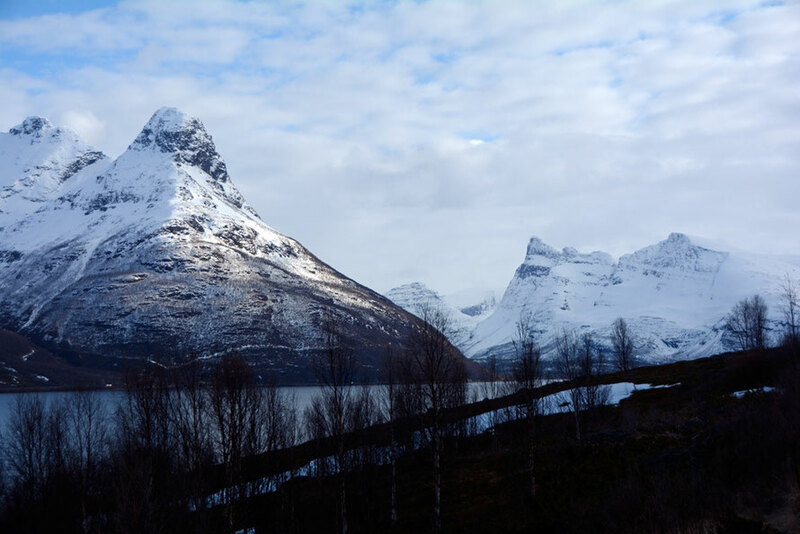 The place chosen to do this was where the main roads - such as they were at that time - from Arctic Norway and northern Finland met at Skibotn on the Storfjorden which is the southern extension of the Lyngen Fjord in Troms county. Here the impossing and incredibly steep mountains run from north west to south east to the Finish border. The only feasible route is to edge past the mountains along the east side of Storfjorden heading south west for Nordkjosbotn through the narrow pass at Oteren. On the other side of the Storfjorden are the towering Lyngen Alps that were a formidable barrier to all but mountain troops. There is the ferry crossing from Oderdalen to Lyngenseidet and from Svensby to Breivik. This was used extensively in the German withdrawal but would have been extremely vulnerable for troops under fire. Part of the Nazi Lyngen Line of bunkers and artillery emplacements with high positions over the main routes south through Norway and Finland (from https://scorchedearthstories.files.wordpress.com/2013/11/p1050152.jpg). The Lyngen Line defences also linked up with existing Atlantic Wall coastal gun emplacements that could be used to stop an attack on the north/south route from the sea. 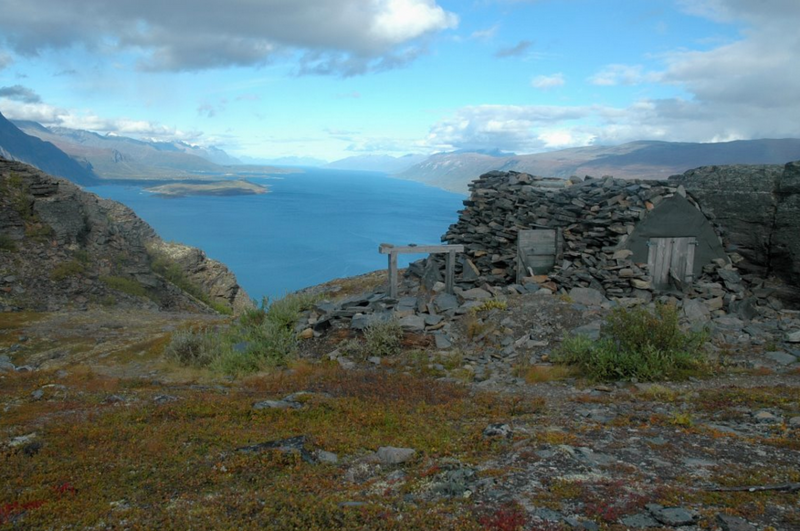 There were medium artillery batteries at Djupvik on the Lyngen Fjord and at Russelv and Lattervick on the Ullsfjorden). 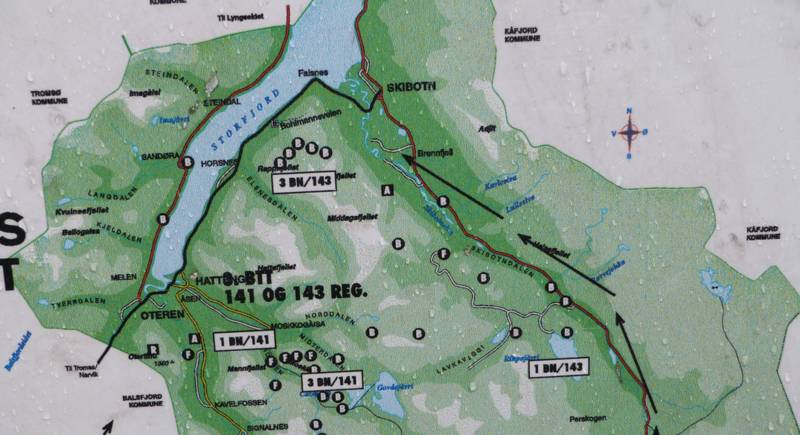 The plan then was to build both artillery emplacements - such as the one at Raigebakti on the mountain spur above Skibotn and a series of bunkers and defensive positions - 150 in all - (see report by Laila Lanes) or 500-800 (Storfjord Kommune) or 550 (Hunt: Fire and Ice, p.175) along the major roads and in the mountains above them. But, given the improvised nature of the Nordlicht withdrawal these bunkers and positions had to be constructed rapidly and required a slave labour force that was provided by 8,000-9,000 mainly Russian PoWs - many of whom had been force marched from north Finland. More of the fierce mountain landscape of the Lyngen Line in April 2015 looking towards Storfjord village and Kitdalen behind. Hatten peak on the left at 1060m and the distant peak of Otertinden (1340m) on the right towering above Singnaldalen. In all 14,500 troops manned the Lyngen Line. These included two mountaineer regiments (the 41st and 143rd Gebirgsjäger Regiments) with artillery regiments and air defence batteries and anti-tank canons of the 6th Mountain Division of the 20th Mountain Army and engineers, transport and communications support troops (see Hunt: Fire and Ice, p.175). 4th Battalion 143rd Regiment ? 1st Battalion 141st Regiment ? 118th Artillery regiment on the west side of the Storfjorden (Hunt: Fire and Ice, p.175). This 6th Mountain Division was under the command of Generalmajor Max-Josef Pemsel between 20 August 1944 and 19 April 1945. He was captured and it looks like he was held at Brigend PoW camp in Wales after the war. He was awarded the Iron Cross in 1944 for a rearguard action in the Petsamo-Kirkenes Operation that prevented the encirclement of the 6th Mountain Division. There is a book about him. See here http://www.photo-war.com/eng/archives/album710.htm for photos of the 136th regiment of the 20th Mountain Army which originally took Tromso during the invasion of Norway. The 136 Mountaineer regiment was raised from the Tiroler Jäger-Regiment that was an Austrian army unit before the Anschluss in 1938. 'Houses in Kitdal built of turves' Stephen Bone, British War Artist, June 1945 (© IWM http://www.iwm.org.uk/collections/item/object/3236). Presumably the houses - note heating - of local Norwegian/Sami residents. One element of the 6th Mountain Division may have deserted in April 1945 when a new Austrian Republic was announced and an appeal was made to all Austrians in the German military to 'surrender or defect". This site (http://www.desertwar.net/6th-mountain-division-wehrmacht.html) claims that 50 men from the 4th battery of mountain artillery of 118th Artillery Regiment of the 6th Mountain Division, based near Signaldalen (the next valley south of Kitdalen) deserted over the mountains to Sweden. 11 were caught by the Germans and four were shot on the orders of Commander Jodl. Hunt (Fire and Ice, p.178) says this took place after May 8th when troops were told that despite the German surrender they would fight on. Understandably concerned at being captured as irregular soldiers a mutiny was planned and in the process two NCOs were shot by the mutineers. Four of the captured men were shot at 10.16am on 10th May (they were 29 and 30 years old). Five were given prison sentences of between 6 and 10 years and 2 were acquitted. 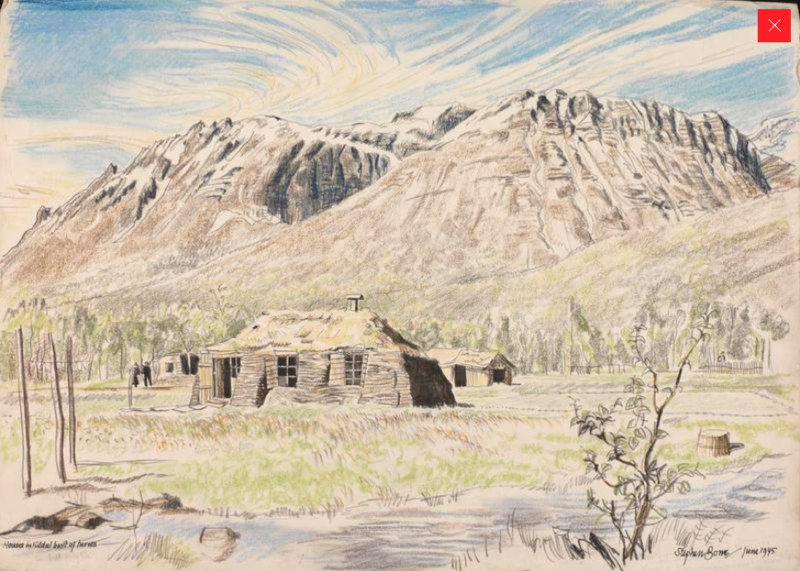 A German Camp in Kitdal Stephen Bone, British War Artist, 1945. 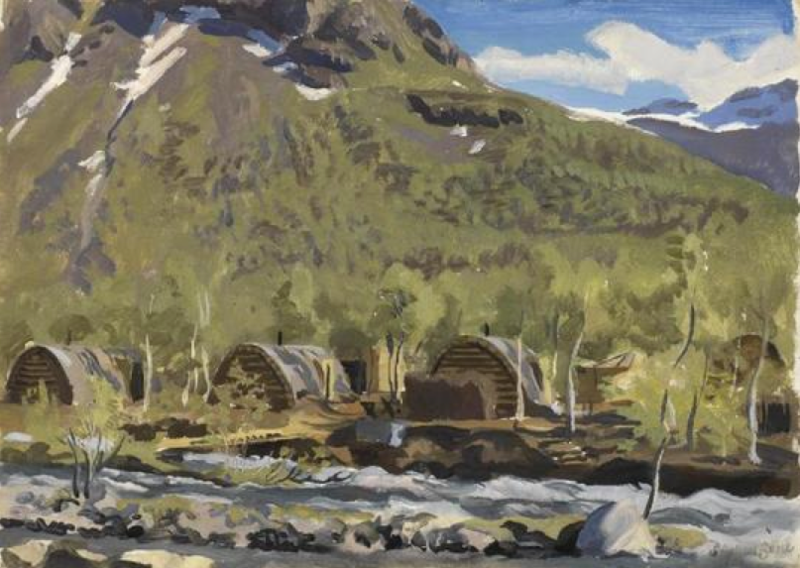 Note log construction and stove chimneys © Imperial War Museum (Art.IWM ART LD 5339 http://www.storfjord.kommune.no/storfjord-1945-en-krigskunstners-inntrykk.5052462-108942.html). 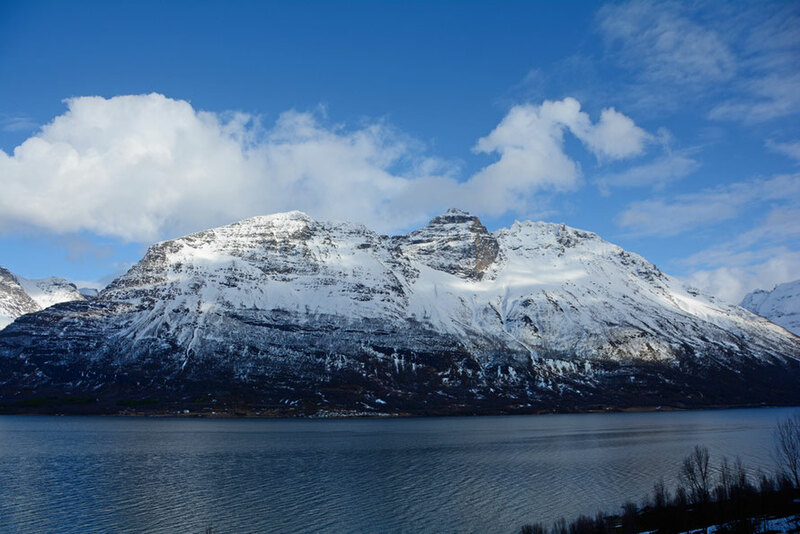 The mountains rise up dramatically from the east side of the Storfjorden to 1,200-1,400 metres. These afforded excellent fire positions over the vulnerable passes and the Germans built many bunkers and fire positions up in the mountains. To assist they built a ski-lift type cable railway to transport supplies up to a central distribution point in the Norddalen valley to the south east of Storfjord and on the north west face of the Falsnjavarri mountain (1,157m) they built a 4km road up the side of the mountain to 550m above sea level. The mass of Hornesfjellet rising to 1321m from the shores of Storfjorden. Hornesfjellet stands between the Russ Road and Kitdalen and Signaldalen. This was known as the 'Bollmann' or 'Russ' Road, and was built by Russian, Polish and Yugoslavian prisoners of war. 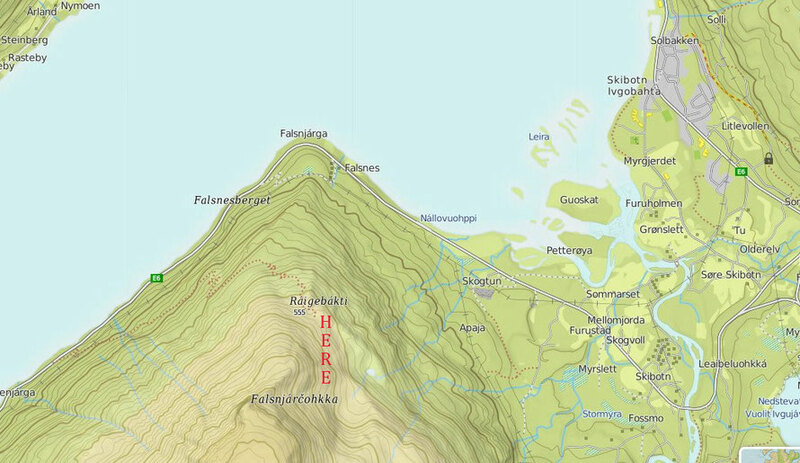 According to some reports of the company of 350 prisoners building the road only 18 survived (see report by Laila Lanes and this Storfjord Kommune website page) This number is questioned by Hunt and the Norwegian PoW experts he spoke to in Chapter Fourteen of Fire and Ice in as much there is no evidence to support it although what evidence there is is 'confusing'. But the exact numbers will never be know if they ever were. 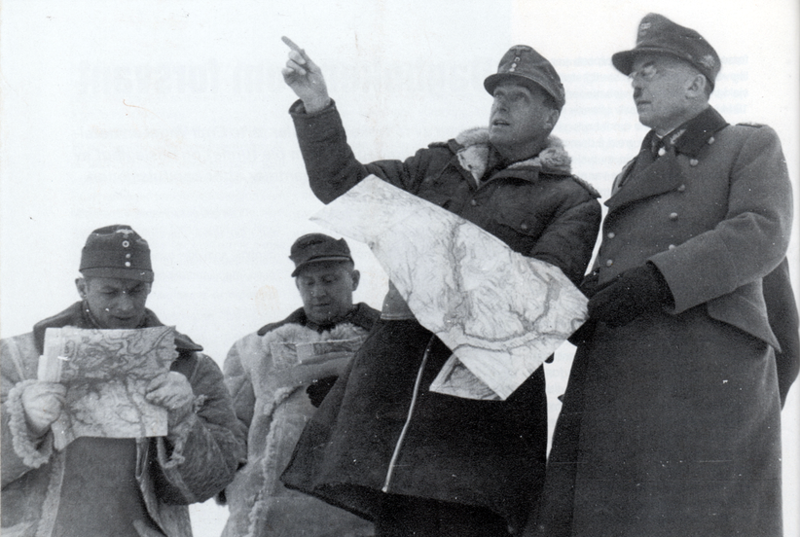 GeneralOberst Lothar Rendulic - 'with Hitler moustache' (Commander 20th Mountain Army) and Generalmajor Max-Josef Pemsel Commander 6th Mountain Division) and two staff officer, November 1944 with map of Storfjorden (Photo: Rune Rautio Collection). The Russ Road built by prisoners of war from camps in the area 550m up on noth facing slope of the Flasnefjellet on the west side of the Storfjord in Troms (Turkart - UT.no). One of the remarkable things about the Lyngen Line is how much of it is still preserved - purely by accident - largely because it was built in such hostile, cold and dry terrain. (Some of this is was under threat from the construction of an electricity line n 2011 www.istorfjord.com/vil-oedelegge-kulturminner.4922095-171348.html). Simon promptly found some pieces of porcelain. One plate was even marked "SS Reich 1940". As there was no division bearing that name (i.e. "Reich") until 1941 this plate is something of a mystery, although Simon since has found a Norwegian diver who has found an identical piece outside the coast of Troms. Presumably the plate belonged to the 6th SS Mountain Division "Nord", that passed through the area in late 1944. Further up we found a sewing machine. ... In one of the bunkers at the top there was even a greatcoat and a pair of officer´s trousers ... several [wooden] shoes [not really 'shoes' at all but wooden soles]... we reckon they were worn by the Soviet prisoners ... as shoes were not issued to them. Some of the stone-reinforced shelters at the top do actually give the impression that they have been untouched since the war (see Arctic War 2013). These guys also found some evidence that bunkers built in 1944-5 had been used by NATO troops in passing Cold War exercises. 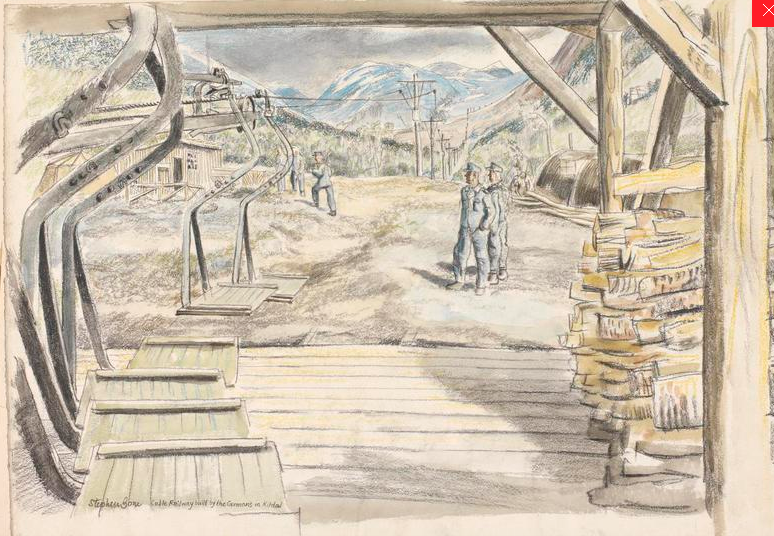 Cable Railway built by the Germans in Kitdal Stephen Bone, British War Artist, 1945 © IWM (Art.IWM ART LD 5316) http://www.iwm.org.uk/collections/item/object/3230). Built to ferry supplies to troops in bunkers in the Norddalen (it started nr Mallnitz). Partial map of Norddalen war sites on the Lyngen Line from Anders Hesjedal (http://www.nrk.no/troms/_-krigsminnene-ma-fredes-1.12018866). 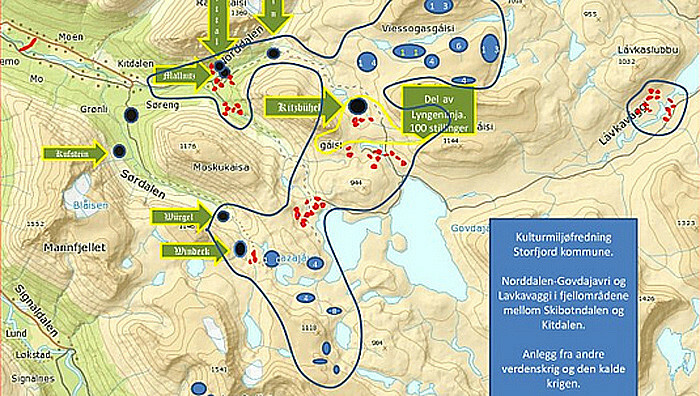 Note: Check Krigsminnelandskap i Troms project leader Anders Desjedal mapping war sites and monuments in Troms.